On Sunday, October 28, 2018, the Alzheimer’s Association's Walk to End Alzheimer’s returns to Mizner Park in Downtown Boca Raton. According to the Alzheimer’s Association, there are currently 5.7 million Americans living with Alzheimer’s disease, with this number expected to rise to nearly 14 million by the year 2050. The Walk to End Alzheimer’s is the world’s largest event to raise awareness and funds for Alzheimer’s care, support, education, and research. This inspiring event is held annually in over 600 communities nationwide, calling on participants of all ages to help join the fight against this pervasive disease. The Alzheimer’s Association is a global organization whose mission is to advance Alzheimer’s care, support, and research worldwide. The organization’s critical work involves providing the necessary care & support to all those facing the disease, driving research toward prevention, treatment and, eventually, a cure, and advocating for the rights and needs of people affected by Alzheimer’s. By joining in the Walk to End Alzheimer’s, your participation & fundraising efforts not only help support the overall mission of the Alzheimer’s Association but will also serve to increase the level of Alzheimer’s awareness right here in our own community. 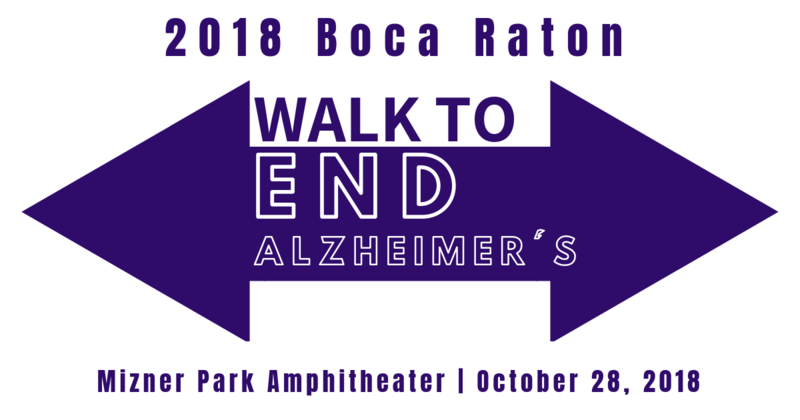 The Boca Raton 2018 Walk to End Alzheimer’s will kick-off at Mizner Park Amphitheater, located at 590 Plaza Real, Boca Raton, FL 33432. Registration will begin at 6:30 am, followed by the opening ceremony at 8 am. The actual walk, a 2-mile scenic route around Mizner Park, will begin promptly at 8:30 am. Though registration will be open on the day of the event, it is recommended that participants pre-register for the Walk to End Alzheimer’s in advance online. The event is free and open to the public, with people of all ages and abilities welcome. While there is no fee to register to participate in the walk, the Alzheimer’s Association provides free, user-friendly tools and support staff to assist all participants who choose to pre-register and fundraise in order to contribute to the cause. Be sure to check out the Alzheimer’s Association website for more information about the annual Walk to End Alzheimer’s. Here you can also learn more about Alzheimer’s Disease as well as the mission and work of the Alzheimer’s Association. If you want to take part in leading the way to a cure, take this first small step and join your fellow community members at the Boca Raton 2018 Walk to End Alzheimers! We at Champagne & Parisi Real Estate look forward to seeing you there!